A student at the American River College Natomas Center was robbed while at adjacent Inderkum High School on Thursday, according to an email sent out by the ARC communications office. According to the email, the victim was sitting at a bench when the suspect approached him from behind, grabbed the victim’s cellphone from his hand and fled the building on foot. A weapon was not reported. The incident was described as a strong-arm robbery. 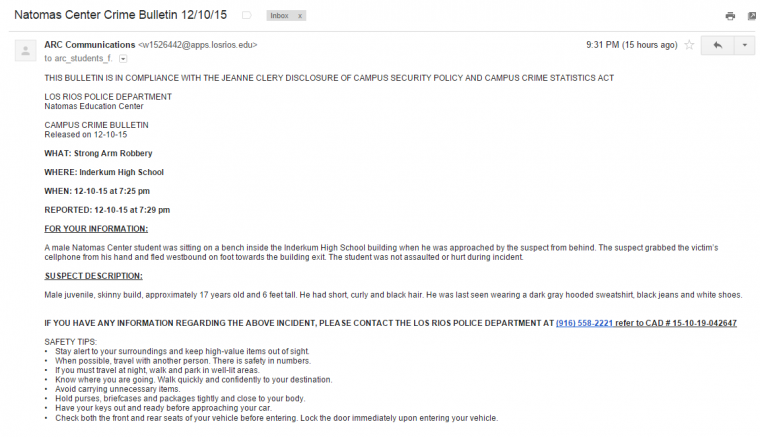 According to the email, the student was not assaulted or hurt during the incident. The suspect was described as male with a skinny build, approximately 17 years old and 6 feet tall with short, curly black hair. The Los Rios Police Department is urging anyone with information regarding the incident to contact them at (916) 558-2221. The Los Rios Police Department did not return a request for comment as of press time. Be the first to comment on "Robbery involving Natomas Center student occurs at Inderkum High School"